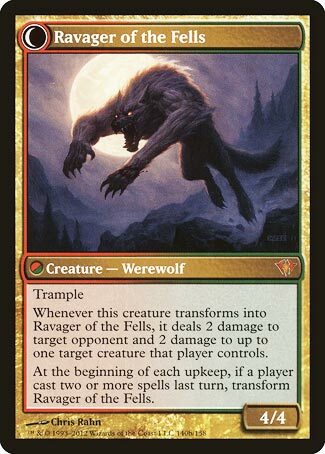 Even compared to other werewolves and double-faced cards, Huntmaster of the Fells has an awful lot of game effects – enough for at least two conventional cards. And even more than other werewolves, he leaves your opponent with no good options. You get an advantage when he first comes into play, and when he transforms at nightfall, and if your opponent manages to flip him back. Players of certain colors might think they’ll be clever and just bounce him or Doom Blade him, but by then it might be too late. And besides, by then he may already have had a chance to hunt with bloodied feet across the hallowed ground . . .
Huntmaster of the Fells stands out in memory as it is one of two mythic rare Werewolves (three if you count Arlin) and was the only one found in the original Innistrad block. While Ulrich was created for Commander, Huntmaster was created to see how far they could push Werewolves. The results are a very powerful card that is a great game ender for a tribal deck. The first ability is like a mini Thragtusk. Werewolves struggle when they are reverted to humans or bounced, but the Huntmaster laughs at such threats. I appreciate the symmetry between the two abilities. While Innistrad‘s most powerful transform card was a common, Dark Ascension brought the fury in the form of the mythic rare Huntmaster of the Fells, a format-defining value engine that ruled a good swath of its Standard era. 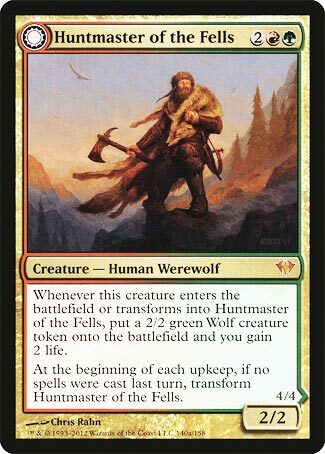 The key to Huntmaster’s power is that it’s not up-front powerful: you start with 2 life and a 2/2 Wolf token. That’s 4 power and toughness, and 2 life, for 4 mana, which is a good rate of return already. If Huntmaster dies to a Lightning Bolt or a Shock, you’re still up 2 life and have a Wolf hanging around, chilling and doing wolf things. The carnage comes on its flip effect: it goes from being a 2/2 to a 4/4 trampler that Shocks an opponent and a creature. That’s now potentially 6 power and toughness, 4 damage, and 2 life off of a 4 mana investment. Werewolf flip triggers are deceptively easy to have happen; there are often turns where you’re happy to pass and let the chaos ensue, and lategame topdeck wars may have a turn where someone blanks. And a 4/4 trampler is always a potent attacking body. Huntmaster, and Ravager, has a well-earned reputation. It still sees some Modern play in Jund or Naya shells as a top-of-the-curve beater, and it will likely always bring the fur and the fury to any table it’s legal at.